Now that the new year has arrived, you may be itching to bring your steel horse out for a ride. While it is guaranteed that you will get back on the road when the weather warms, unfortunately, your safety is not a guarantee. Before you get back on the road, familiarize yourself with the basics. Even if you know everything there is to know like the back of your helmet, a review only hurts when it does not happen. Knowing the five most common motorcycle accident injuries before the motorcycle accidents occur can help you prepare for the possibility with any necessary precautions. With the knowledge of the top five motorcycle injuries include head injuries, road rash, muscle damage, Biker’s Arm, and leg injury, you can become proactive in your riding habits. Protecting yourself protects your loved ones as well. 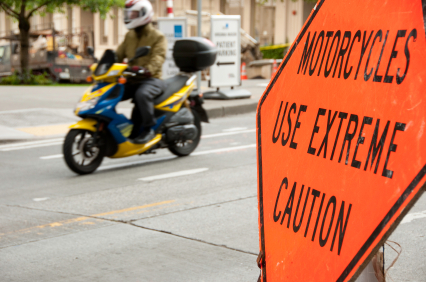 Motorcycle accidents are a threat to any driver, and should be avoided at all costs, as safely as possible. An auto accident injury is dangerous as it is; a motorcycle injury is even more life threatening. Taking precautions now is the first step to protecting your future. Your head is one of the most important parts of your body. It not only houses your skull, but also your brain. Your brains it he heaviest organ in your body, and if it becomes swelled past the barriers of the skull, that is a recipe for trouble. If your skull becomes cracked or otherwise damaged, immediately go to the hospital. The most common injury from motorcycle accidents is a head injury, which includes a concussion and even brain damage. While a concussion can range anywhere between mild to severe, brain damage is not only debilitating, but can also be fatal. Any sort of contact to the head should be closely monitored. Neck injuries are also as common to motorcycle accidents as head injuries, as they are closely related. A neck injury can paralyze and possibly kill, so protecting the head and neck are of utmost importance when behind the wheel of any vehicle. To protect yourself from such injuries, a helmet should be worn. While this sounds basic, a helmet can mean the difference between living another day and dying on the pavement. Many riders have had experiences of survival thanks to their helmet. Wear your helmet every time you ride your motorcycle, even if you are planning to be riding only for a short amount of time. Road rash is any injury sustained from a rider that endured the situation of sliding across the pavement after a motorcycle accident. A rider can fly over the handlebars due to the impact, and the concrete rubs on any exposed skin as the body skids across the pavement. Sometimes if the clothing is thin enough, the pavement can scrape away through the layers of clothes, reaching to the skin underneath. This injury is not just a cut, scrape, or a simple bruise; it can also lead to more permanent damage such as skin irritations, infections, and even surface nerve damage. In incidents where road rash becomes a prevalent injury, get it professionally cleaned and treated by medical professionals. You may also need antibiotics to avoid infection. To avoid the instance of road rash in the event of an accident, protective measures can greatly lessen the injury if not protect it altogether. No injury can be completely avoided, but the proper steps now can possibly save your life later. Jeans by themselves will not protect you from injuries sustained by skidding on the pavement, though there are specific motorcycle jeans to wear while on the road. Other protective garments include kneepads, gloves, and jackets. Leather is the best material to guard against road rash. Muscle damage, anywhere in your body, may become permanent after a motorcycle accident. Prevention is thus all about protection, and you will need to take the necessary measures to protect any and all muscles. If muscles are not properly protected, the end result could be paralysis, forever inhibiting your daily routine. The first step to protecting yourself beyond safe and defensive driving, is to wear the protective gear described in the last section. Further actions include seeking medical attention soon after the accident for a further specific analysis. An often forgotten muscle, the eardrum, should be protected as well. Wearing a helmet protects your head, but increases the amount of sound the rider is exposed to. Wearing earplugs can protect you from bursting an ear drum or becoming deaf. Be sure to wear ear plugs designed for your ear, as you still want to hear some sound to safely interact with your driving environment. Biker’s Arm is a condition that occurs after the initial impact of the aftermath of the accident. When an individual is in a vehicle with a seatbelt safely fastened, they will most likely not fly many feet for they are more or less protected by the structure of their own car. A motorcycle does not have that steel outer skeleton acting as a liaison between rider and environment. A motorcyclist risks being thrown off of his bike in the event of an accident; it is human instinct to draw one’s arms around or in front of oneself to lessen impact. This means, however, that more impact means more damage to the nerves of the arms. When a biker’s arm is landed on during impact, permanent nerve damage may occur in the arm as well as the upper body. Sturdy jackets and elbow pads may be worn to protect against severe damage. Another common injury from motorcycle accidents involves injuries not only to the leg, but also to the knees and feet. When these types of injuries occur, it will most likely not have a fatal outcome; however, the injury could grow into something worse if not permanently disabling. Injuries to the lower extremities include shattered or fractured bones or knees. Legs or feet can become broken, and injuries will more often than not include scrapes, large cuts, or road rash due to skidding, and even severe bruising can occur. Protective leather clothing as well as kneepads can be worn. Even protected, severe injuries may occur. Long pants, motorcycle boots, and safe driving are all methods of proactivity against unsafe chances on the road. Every precaution is an extra step to safer driving. Every time you mount your motorcycle, you take a risk on the road. Protecting yourself greatly lessens those risks’ enabling yourself to live a longer life. Be sure to visit the hospital for very and any injury attained by a motorcycle accident, and take pictures of your injuries if you were the one hit. Do not try to do anything you are not comfortable with, and do not be reckless while riding your bike. If you are riding with your friends, be sure to ride with friends who are also taking precautionary measures against an accident. Riding with other experienced drivers is in itself a precautionary measure; ride with others who are not risks to themselves or others, and be sure not to be a risk yourself. Wear your safety gear every time you ride, and treat any injuries you endure. Riding your bike should be a fun and safe endeavor, especially at the start of a new year. Personal Injury Blog, Our Family Helping Yours. Subscribe Today! As a large law firm, we have the resources and talent to handle your personal injury case with the care, compassion, and personal touch you deserve. With Lowman Law Firm, you will always work directly with our lawyers. With offices located throughout central Florida, we have successfully served clients all over the state.